DR SHE BLOGGO: Orphan Black 2.08 - "Variable and Full of Perturbation"
Orphan Black 2.08 - "Variable and Full of Perturbation"
Hello, universe. Remember when I wrote Orphan Black reviews? Yeah, me neither. And if it turns out that I barely remember Orphan Black itself, just leave me a little comment to nudge me towards accurate information. Additionally, since this is the episode with Tony, please let me know if I inadvertently demonstrate ignorance towards his trans identity, or the trans community. I will absolutely make corrections. So let’s do this, shall we? It’s only five months later! Clearly, the writers have introduced Tony to do exactly that: raise questions about what it means to be genetically identical, and the biology of gender identity and expression. They’ve wheeled out a substantial topic to parse, and yet they concurrently do something kind of wonderful: they don’t try to. No one says, “Hey, how can this be?” They only say, “Oh, I guess this can be, then.” Which is lovely, because that means that Tony’s identity, itself, is never called into question. Questioning the existence of a trans clone is not any different than questioning the existence of a trans human, and OB’s not playing that game. What’s nice about this portrayal is that it falls in line behind the LGBT representation that Orphan Black has already casually yet firmly displayed. Cosima’s sexuality is never questioned, and so neither is Tony’s. Gender and sexuality will always slide back on the list of main identifiers for these characters - like Cosima told Rachel, it’s not the most interesting thing about them. Sure, they’re clones, and that’s always going to hold the trump card on interesting, but also, it’s quietly prescriptive: clone or no clone, that’s how it should be. As a result, this plugs into grander, more universal themes. Humanity is a central tenet of this show, and every clone expresses the need to be treated as a person and not a project. We are not what defines us; we define ourselves. This contextually-LGBT philosophy is actually central to the show, echoed across all the main characters, regardless of sexuality. The ability to express one’s own identity is a human right, regardless of gender, sexuality, science, or nature. It blows my mind a little bit that Orphan Black is thus a show that doesn’t narratively sequester LGBT themes in a “niche,” but rather carries them over to all the main characters. So really, “variable and full of perturbation” is not just a phrase for Tony, a trans clone. A major theme this episode was, “It’s not just me; it’s all of us.” We’re not talking about Tony being variant or perturbed because he’s trans. All of the clones are variable, and full of perturbation. There are two previous episodes that have some version of the word “variable” in the title, and if you look up “perturbation,” you don’t necessary get the synonym “disturbed” (a word you really don't want to see applied to anyone identifying as LGBTQIA) - you get the emotional application, “anxiety, mental uneasiness,” and the scientific application, “a deviation of the system.” If that doesn’t describe everything about Orphan Black, I don’t know what does. There’s also Tony and Sarah. Of course, Felix says, “He has some of your worst qualities,” about Tony the clone, but we also get a little scene with Rachel that illuminates the concept of variance. What exactly is it about Sarah that makes her so different? Why - not how, why - did she succeed in fertility when they were designed to be barren? Like Tony, she was raised out of the control of DYAD, unmonitored, and that has cultivated a whole host of “chaos” on her identity. Can we say exactly what happened, biologically, genetically, environmentally? No. It’s just who she is. And the same goes for Tony. The idea that “it’s all us” is specifically voiced by Cosima, as she struggles to forgive Delphine for betraying her trust in favor of protecting her. (What’s that about respecting what people express about themselves?) Delphine can’t make decisions for Cosima, because a) that’s a basic human no-no, but also, b) Cosima comes with Sarah, Kira, Helena, Alison, Tony, and yes, even Rachel. No clone is an island; their fates are entwined. Rachel herself voices this as well, as she uses the phrase “all of us” not once but twice in this episode (once with Delphine, once with Duncan). So, from a thematic perspective, Tony slides easily into the world Orphan Black has created for itself. Welcome to the family. But from a narrative perspective? Admittedly, the introduction of Tony feels something like proof of concept. He whisks in, from nowhere, and whisks back out, into the black, with only the Clone Phone as a direct line back to the narrative. In the grand scheme of the season, it’s likely that he will lift right out without any consequence. Hell, in the episode, he lifts right out without much consequence. They had to really work the timeline to pull Sarah out of her own plotline to even meet him. Yes, they invented a reason to make Tony relevant: he comes bearing a message. Mystery! Intrigue! Suspense! Well - theoretically. Tony’s message comes from Beth, via his dead partner (or monitor?) Sammy. Narratively-speaking, messages from the dead are usually good devices. But this one fell short. There weren’t enough stakes generated during the time Tony held onto the message (except the looming threat that Felix was going to kiss a genetic identical of his adopted sister) - and the reveal of the message, which should ramp everything up, felt more like the air going out of a balloon. Something about Paul, or something? At which point Sarah screwed up her face and said, “Paul?” Like she was trying to place him. Us too, Sarah. Us too. His absence isn’t all that inconvenient, nor his is silence all that irksome, contrary to what Rachel says. In all seriousness, bringing a message that Paul is military and is “on it,” is not all that revelatory, mostly because that message seems to baseline “he’s a good guy, DON’T WORRY” and not much else. Yawn. Orphan Black has long-suffered from a Paul Problem, and this message pretty much sums it up. He’s supposed to be a mystery, which is supposed to invest us - but the problem is, there’s not enough there to make us care. And they can’t give us more information to hook us, because a) then there’d be no mystery, and b) this is not Paul’s show. As a viewer, I would probably be annoyed about following Paul through a mysterious adventure, thereby taking screentime away from more interesting elements of OB. In a way, “Variable and Full of Perturbation” reminds me of a one-off episode that borrows elements of a different genre - in this case, a crime mystery. We begin the hour in the middle of a car chase, where we meet a brand new character, and then wonder how this all connects to the main narrative thread. In other words, the pre-credits sequence was exactly like one in Bones or Castle, with a hint of Lost sprinkled in. Then, Tony has a mysterious message, and won’t talk until he gets more information - which Felix isn’t willing to give up until he gets more information, through Art. Stand-off. Art conveniently gets information, with no obstacle. Added to that, there’s the suspense that someone’s going to come after Tony and shoot him too - except it doesn’t even come close to happening. It’s very cop show-ish, without much air in it. Let it be said, though, that genre-borrow isn’t necessarily a bad thing - but it definitely makes itself noticed. In another way, the hour reminded me a bit of the Lost outing that “explained” Nikki and Paulo, distracting itself with a conceptual hook and letting an element of tension and dramatic irony carry through the diversion. (And then promptly ending with only a remote possibility that this would be brought up again.) But the bad thing about Nikki and Paulo - and the risk of genre-borrow and one-off episodes on serialized shows in particular - is the nagging question who cares? 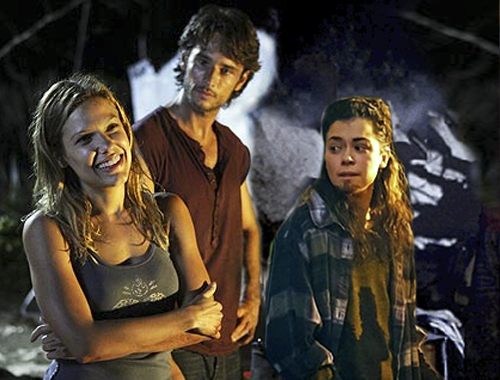 Why care about these yahoos when Jack and Kate and Sawyer are traipsing around? This same nagging question surfaces with Tony, unfortunately. Would it have been better to parcel off some of Tony’s screentime to another character - Cosima, or Helena, or even (dare I say it) Paul? If there weren’t another story thread or emotional beat that could have benefited from more clocktime, I wouldn’t necessarily say yes. The problems in Tony’s storyline could be fixed within Tony’s storyline. But in “Variable and Full of Perturbation,” there was another area that could have used the extra time - with Rachel Duncan’s meltdown. That sequence should have been great! Here’s this character who’s been buttoned-up for so long, pressurizing her emotions in fragile glass, and finally - she combusts. It’s a huge deal, right? Except it wasn’t, really. The cutaways were, first of all, confusing, because it was difficult to tell the time and place for of her breakdown. The sense of disorientation pulled the audience out of the moment, and we weren’t so much feeling anything as wondering where we are. You could argue that the cuts helped to make her explosion more jarring in contrast with her usual demeanor, but I personally feel like we should have seen a stone-faced Rachel slowly crack and then unleash her tornado of pain and anger. Cutaways just don’t do it justice, especially when they untether the audience from the emotions. The scene would have benefitted from more screentime to build that emotional climax, and unfortunately, Tony’s part is the storyline with excess time to give. So, in the end, the point of bringing Tony into the fold kind of remains on the idea that the OB writers wanted to demonstrate that a trans clone is, indeed, possible. And y’know, given the space that Orphan Black has created for LGBT characters, and the way their presence is fundamentally thematic in all of the main characters -- it’s hard to argue with that. This is the concept episode, the genre episode, the proof of concept, and the proof that identity - gender, and sexual - is in a person’s voice, not their DNA. But in the realm of television writing - story building, plot threading, stakes and obstacles - “Variable and Full of Perturbation” was a little left of target. How much did I love Kira’s exasperated “MO-OOOOM!” at Sarah questioning if Dr. Moreau was appropriate for kids. How lovely that they still get to have some hints of “normal” mother-daughter interactions. Kudos to Josh Vokey, who plays Scott, for the scene where he finds out that Cosima is 324B21. It’s a lovely little moment of realization and compassion, as suddenly the science becomes very human for him. THE KIDS ARE TRUANT. Alison’s manner of speaking is still the best thing ever. Also, of course she would criticize Donnie’s sloppy handling of Leekie’s body. And of course she’d be irate that Donnie used one of her guns. Of course, Alison. “You cannot imagine the strange colourless delight of these intellectual desires. The thing standing before you is no longer an animal, a fellow creature - but a problem.” This week, on meta-relevant excerpts from in-narrative novels! Did Tony remind anyone else of Apolo Anton Ohno? I mean, it’s Canada. He probably skates.